If you are attaching a file when creating a new Trello card from email and that attachment is showing up in Trello as a "winmail.dat" file instead of the attached file, you'll need to make some adjustments to Outlook's settings. Outlook can be configured to use a proprietary encoding method that isn't typically understood by non-Outlook mail clients. This is usually referred to as Outlook RTF. Click on the File menu, and then click on "Options"
Click on "Mail" in the left column, and under "Compose messages," make sure "Compose messages in this format:" is set to "HTML"
Changing this setting will ensure that new messages are sent as HTML by default. 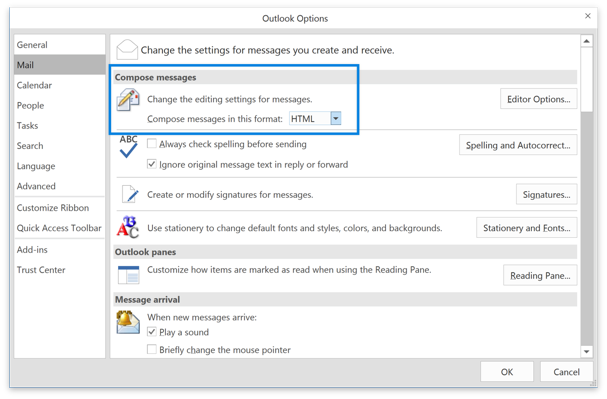 It's possible to send messages in Outlook RTF if that's been pre-configured, so you'll need to change one more setting. Still in the Mail Options window, scroll to the bottom, and under "Message format," make sure "When sending messages in Rich Text format to Internet recipients:" is set to "Convert to HTML format." This will ensure that any outgoing mail is converted if it's sent to a non-Outlook user like Trello. 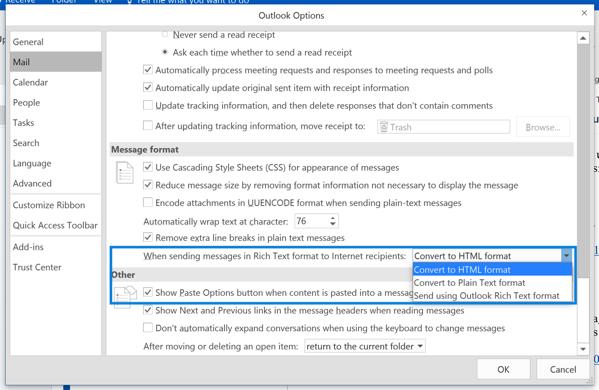 Click on the Tools menu, and then click on "Options"
Change "When sending Outlook Rich Text messages to Internet recipients, use this format:" to "Convert to HTML format"
Outlook has probably saved your Trello email address and is offering to autocomplete it when you start to type the address. You may also have saved the email address to a personal contact. Outlook will save settings in these instances, so you should delete the autocomplete entry or the contact to ensure that Outlook will respect the global settings. If you're using a company computer, you may need to consult your company's IT group for further changes.